National Collective: ‘Imagine A Better Scotland’ is the Edinburgh leg of the Yestival tour, brought to you by National Collective. Over 4 days and nights, at Summerhall Arts Centre, National Collective presents a series of events designed to engage, inspire and enthuse decided and undecided voters alike, including a series of lectures; scratch-theatre performances; one of the popular National Collective Edinburgh Sessions; a book launch; a Trad Yes Ceilidh; a stand-up comedy event and an after-party with top DJs. There will also be a Documenting Yes exhibition, which will showcase the breadth and depth of the Yes movement, and which will be open to the public over the entirety of the four day mini-festival. All events are FREE, but reservation is advised for the lecture series in particular, as capacity is limited. On our Eventbrite page, you can also order a National Collective pack that you will be able to pick up prior to your event, or make a donation towards the costs of our campaign. A full and detailed downloadable programme will be released shortly, but in the meantime, check out the listings information below; reserve your tickets; share the event with friends! 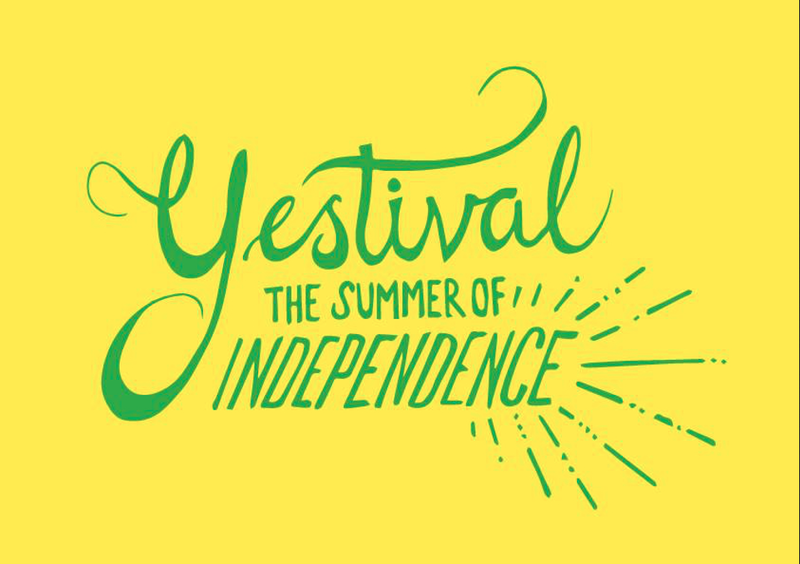 We hope to see you at this, and at our other Yestival events throughout the whole of July. Imagine Better. Listings follow! 1PM (Lecture) – John Harris: Independence and the English Question: Prospects For The Left. 7.30PM (Dissection Room) – National Collective Edinburgh Session (With Kieran Hurley, Jo Clifford, Ruth Mills, Sam Small, Iqbal Fathki, A New International, Nuala Kennedy & Band and Kid Canaverel! 4.30PM (Lecture) – Class Matters (Panel discussion with Harry Giles, Cat Hepburn, Victoria Heaney and Darren McGarvey (aka Loki) Chaired by Zara Kitson. 6.30PM (Lecture) – Alan Bissett: Get Yer Hits Oot For The Nats! 7.30PM (DR) – Inspired By Independence book launch. 9.15AM (DR) – ‘Place’ – An open forum event in four sessions designed to explore, assess and critique contemporary cultural trends and future emerging paths for the particular part of the planet called Scotland. 5PM (Lecture) – Tom Gallagher: Why BOTH Referendum Contenders are Letting Down the Little People of Scotland… and Britain in 2014. Hosted by Steve Byrne with Kathleen MacInnes, Mike Vass, Brian OhEadhra Amy Geddes and more! Yestival ceilidh band led by David Francis. Throughout the day: family-events, an outdoor barbecue, and a series of photography seminars. 7.30PM (DR) – Stand Up For Scotland (With Hardeep Singh-Kohli, Susie McCabe, Keir McAlister and David Kay. FYI: several of the links in the article are to facebook redirects, not directly to the target pages, and so have to be manually copied and pasted by readers on networks that block facebook. looks like a wonderful programme – best wishes for every success! !